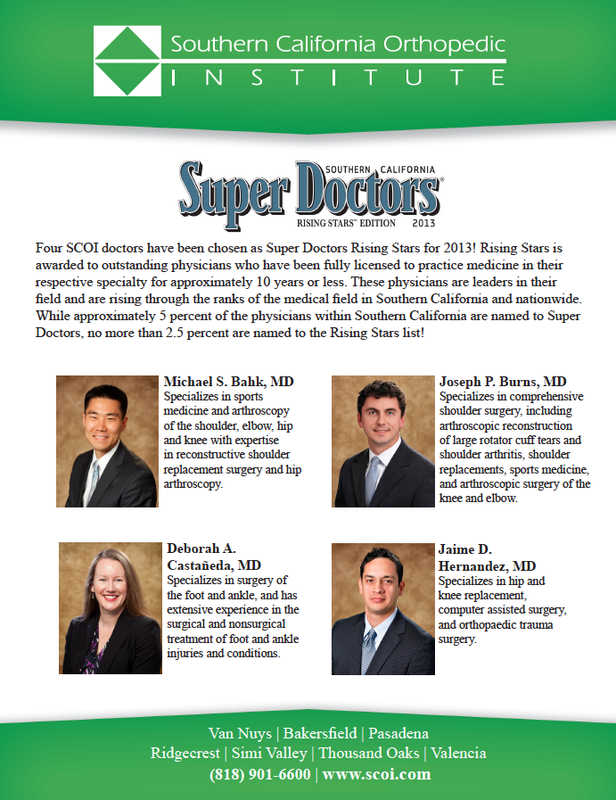 SCOI's own Dr. Bahk, Dr. Burns, Dr. Castañeda, and Dr. Hernandez were all chosen as Super Doctor “2013 Rising Stars”! Rising Stars is awarded to outstanding physicians who have been fully licensed to practice medicine in their respective specialty for approximately 10 years or less. These physicians are experts in their field and are rising through the ranks of the medical field in Southern California and nationwide. While approximately 5 percent of the physicians within Southern California are named to Super Doctors, no more than 2.5 percent are named to the Rising Stars list!